Fostering wild kittens is easy! One ignores the growling and hissing, and gradually gets the kittens used to human hands, with lots of patting and attention. 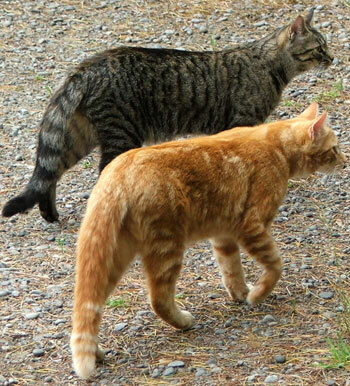 One gives them lots of time, and the very best food, and then finds a good country home for them to go to. That's the theory. Unfortunately I have a 'soft spot' for ginger cats. And tabbies, and greys, and... We'll stop right there! Anyway, as soon as Percy purred I thought I might be in trouble. And then over three days I watched as his kitten-blue eyes became flecked with amber, finally changing colour completely. This was a close, magical, defining moment in our relationship. 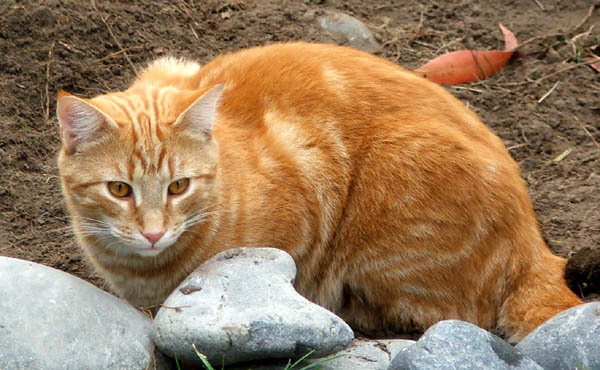 Ginger cats make brilliant gardening cats - and Percy is no exception. 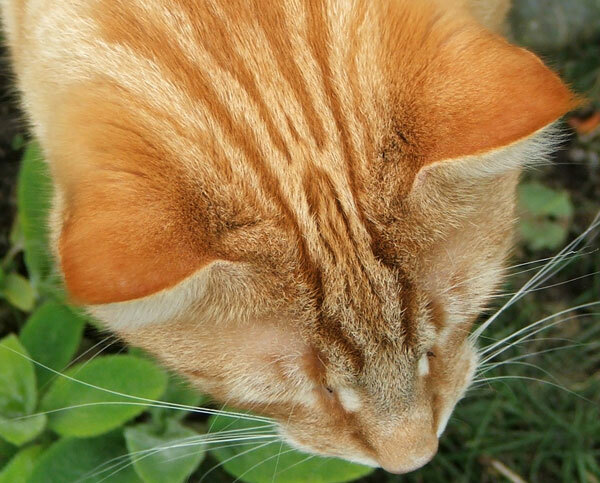 My old gentleman Gingerpuss started the tradition, and Percy is now the fourth ginger gardening cat to leap upon the tussock grasses in Mooseys Country Garden. He loves being a country cat in a country garden - coming on walks to feed the hens, roaring around the back of the Moosey Pond or romping in the Hazelnut Orchard. In the house Percy is a big, floppy, smoochy cat. He sits on my lap whenever I'm typing at the computer - as he is now! Good afternoon, purry Percy. Other cats will blunder across the keyboard, but Percy has impeccable computer etiquette. He skirts elegantly around the back and slithers in cosily between the table and the Head Gardener's tummy. 'hhhhhhhhhhhhhhhhhhhh76!' - Tuesday 29th July 2008, 10 a.m.
'[[[[[[[[[[[[[[[[[[[[[[[[[89iiiiiiiiiii77777778:10 a.m. 24/04/2008' - Thursday 24th April 2008, 8:10 a.m.
Inter-feline relationships can be tricky, but not for young Percy. He has a very uncomplicated approach to the other cats and the dog. As well as being a jolly decent brother to his siblings (Histeria the tabby and Lilli-Puss the grey) he double-teams well with Fluff-Fluff, my supreme Moosey gardening cat. And Percy is the perfect big house-brother, patient and kind, to disabled Mugsy, my not-very-brainy orange and black cat. The routine goes like this. Percy flops over with his beautiful striped tummy in the air, and little Mugsy is allowed to pounce. Percy then wriggles limply - and Mugsy thinks she's won. Totally ignored by all the other cats, this brings her no end of happiness. Well, Percy, welcome to your new life. I hope you're glad to have been 'rescued' from under that pine hedge in the horse paddock. I'm so glad I didn't give you away. Long may you purr in your cat basket, enjoying the good life at Mooseys. 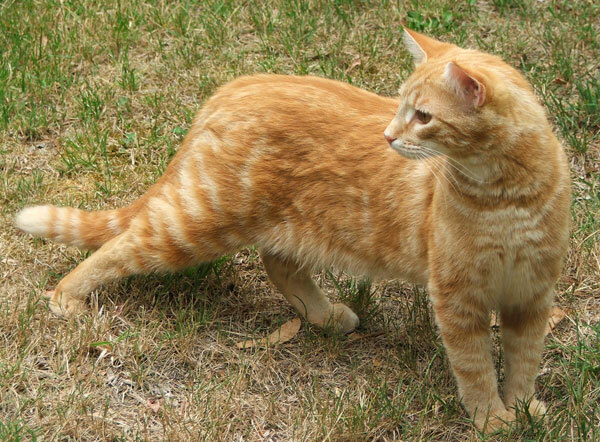 Later in his life Percy was diagnosed with Feline Aids. He lived on with no problems, but then one day in August 2016 he wasn't in the house. I never found him. I suspect he might have succumbed to some sort of infection. Rest well, my lovely ginger boy.